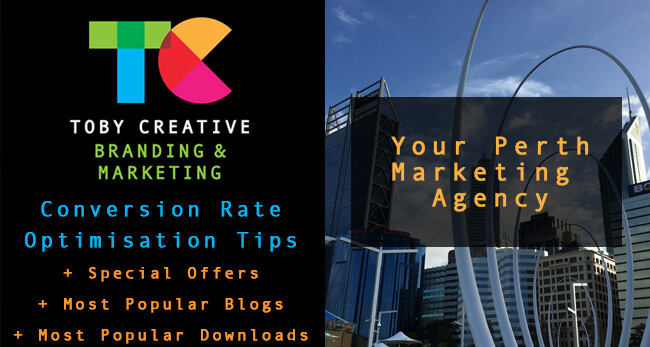 Toby Creative – Branding & Marketing are your friendly, affordable and effective Perth marketing agency. We offer a truly integrated marketing strategic approach, with guidance and support, good communication, clear reporting and useful resources to empower your marketing effectiveness. Conversion Rate Optimisation (CRO) is about making the most of the website visitors that have been directed to your website either through organic, paid or direct means. There is a lot of marketing effort to source new prospects, so when they reach your website you ideally want them to engage with you and perform your desired actions; purchase a product, fill in a form, enquire about a service, visit your store, pick up the phone etc. Not every website visitor however is ready to perform that desired action immediately, particularly when they are in research mode. At this stage we want to be sure to entice the consumer to remain ‘sticky’ to the brand, so that they will continue to receive trigger reminders about your brand to encourage them to re-engage and take that action. It is common for the online consumer to get distracted, as there are a lot of sparkly distractions in the online space as well as exhausted from their search efforts. We know that most consumers are comparing 5-6 other competitor websites whilst looking to choose their preferred provider and as the dollar value of the product/service increase – such as buying a house, then more time and effort goes into making an informed decision. At this stage of the consumer research phase your online website needs to perform the actions of a helpful sales assistant, be available to answer questions that an impatient consumer doesn’t want to dig around and have to find themselves – remembering how time poor many consumers are, as well as easily distracted (bit like having a gold fish memory span). Obviously, your website should ideally have an easy to navigate menu system to enable the consumer to reach their desired path of interest within one click. This should be supported by a functional and effective internal search box, allowing the consumer to perform a query to find exactly the information of interest. For an internal website search tool to be effective, you need to have effective website content! This is a win-win for search engines as well, particularly when your SEO team consider LSI (Latent Semantic Indexing) and the multivariate search phrases that can be used based on user intent but influenced by their own language skills, gender influence, age, culture and ethnicity, as well as education and environmental conditioning. Consider creating a useful FAQ (Frequently Asked Questions) section in your website, which can also form the knowledge base for canned responses in chat applications or AI bots for your brand as well, providing useful answers to some of the most commonly asked questions by consumers. If you want a new prospect to remain ‘sticky’ to your brand, now that they have discovered your website you can provide visual action cues such as social media links, to encourage the user to follow your brand on their preferred social media channel – also very useful to have these social media links provided during the research phase for the consumer, as they use these to determine trust signals through third-party interaction on the brand social media channels as well as review sites, which are unbiased by the brand’s own marketing. Adding a newsletter subscription option will encourage the consumer to subscribe to receive your regular brand eMarketing messages and access special offers and discounts. Burying this action at the bottom of your website may cause it to not be seen when 80% of website visitors still don’t scroll down below the fold (the top visible portion of your website that is displayed on the screen when it loads). Don’t forget to add an opt-in check box within your contact forms on the website as well so you don’t miss the opportunity whilst the consumer is contacting you in a message or buying a product in your online store to subscribe them to your newsletter. Additional marketing considerations which can be taken to keep a consumer aware of the brand during the research phase, where no actual consumer action is required, is remarketing and retargeting. Using Facebook Ads and Google AdWords, specific adverts matching the consumer’s interest, based on the category or section of the website they visited during their time on your site, can be displayed to the consumer for a specific period of time and frequency after their visit to your site which helps reinforce your brand offer, points of difference, and is a visual reminder of your brand whilst they consider their choice of provider. If you are interested to know more about AdWords and Remarketing let me know. Because time is so important in this age of instant gratification, does your website provide clear and visible access to a contact phone number so that the consumer can call your business to order or make a query? Having a clickable phone number for mobile devices to instantly connect the call is a must have. Some keyboard warriors are shy and don’t like the direct contact approach through a phone call and would prefer a less confronting option to be able to ask their questions, receive directions and engage with the brand. Subsequently having a Live Chat feature on your website provides the perfect CRO tool to respond to a customer’s queries or concerns whilst they are in the purchase cycle to avoid abandonment and departure from your website or online store. 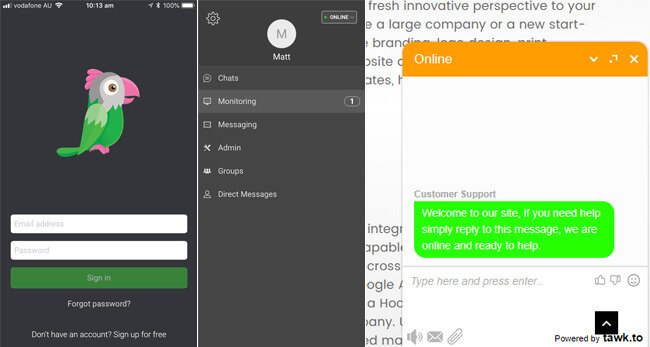 There are now a lot of choices of website live chat applications, though there are miles between the contenders in this field on the spectrum of functionality, ease to use, features and costs. I’m happy to recommend the tawk.to live chat application which is free (costs for additional add-on advanced feature options, but you will probably never use these! ), and has a free APP – which is a very important consideration, so I can monitor live traffic on our website and engage with customers whilst not being tied to sitting down at my own keyboard. The application is very configurable with a range of customisations, triggered messages, page specific actions and timer events. Interested to know more, let me know. We charge a low $130 ex GST to install and configure Tawk.to for your website. Finally, and it may appear as the last-ditch effort, but you are bringing out all the big guns now to try your absolute best to achieve the outcome of a conversion from the traffic you have generated to your website, consider an exit pop-up. For the desktop user, a rapid motion upwards with their mouse in an action that appears that their intention is to close the browser window will trigger a departure form to appear offering assistance, reminders to stay sticky to the brand, and an opportunity to subscribe to your newsletter or prompted to ask a question. Clearly stating an action that you would like a consumer to take makes them consider these options and does lead to a higher level of interaction. Avoiding frustration through repetition is achieved using session cookies so that the action only occurs once for the user. Interested to know more, let me know. We charge $130 ex GST to install and configure an exit pop-up for a WordPress website. Contact Toby Creative – Branding & Marketing now on (08) 9386 3444, email info@tobycreative.com.au or fill in our contact form on our website. We offer a no obligation, free initial consultation at your location so that we can discuss your specific marketing requirements and provide a tailored quotation so together we can start effectively planning a marketing strategy that will work for your business. We have received so much positive feedback on these two free resources for marketing that we have provided this year. If you haven’t got them already, download now! You are going to love them as they make planning your marketing strategy and content in 2018 a breeze! Firstly, they are free; no cost, no expectation, no hoop to jump through. Just click on the links provided, download directly and use. We’ve done all the work, so you don’t have to! Plan your marketing expenses allocation for all your marketing campaigns, activities, third-party providers, subscriptions and resources in 2018, month-by-month, with separation between online and offline marketing campaigns. Automatically tally up marketing costs per month that you apply, and for the year. Consider the large range of marketing activity suggestions to test-and-measure, and carefully allocate your monthly budget between. This is a structured template for monthly and annual marketing budget planning and preparation, for approval, sign-off and tracking of your campaigns by your management and accounts team. Plan your entire year of marketing strategy, campaigns, activities and social media posts with this free template. Simplify and streamline your marketing campaign preparation and social media planning for 2018. This is going to save you many hours of work and research. Our 2018 Marketing Calendar provides a clear month-by-month and daily calendar for scheduling marketing campaigns, EDMs and social media posts. The calendar includes all local, state and national holidays, school holidays, religious events, special events and observances. We’ve included moon cycles, zodiac phases, and daily/weekly/monthly information to make planning your marketing campaigns so efficient. As an additional bonus, we have provided an entire month guide of social media post suggestions to power your social media strategy.